Tim turned to his camera and started to film. 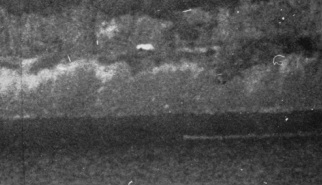 1300 yards away the object travelled in a zigzag pattern, leaving a distinctive V wake with no sign of a propeller wash.
As the object neared the far shore it turned west and almost completely submerged. Travelling just below the surface the object kicked up a wash measured at two feet and moved at a speed estimated to be 7–10 mph. The full 60-second film sequence can be watched here. You will notice a jump in the film; this is due to the camera's clockwork motor having to be rewound. To gain the full effect, enlarge to view in full-screen mode. 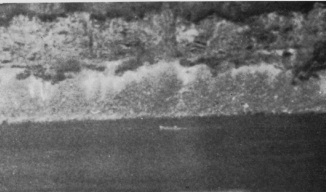 The object leaves a smooth glassy wake, no propeller wash visible. 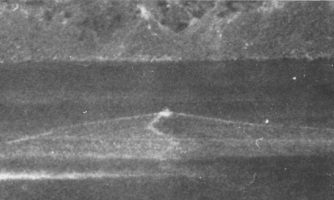 Boat crossing the loch one hour after Tim filmed the monster. 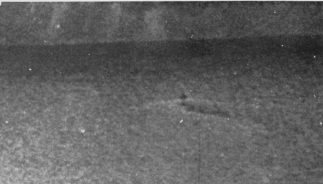 The object is fully submerged, throwing up a two-foot wake. The camera was about to run out of film. Tim had to make a decision; he decided to stop and save the last precious feet of film. He raced down the narrow road to reach the loch side, hoping the animal would resurface. This time he would be close enough to capture the creature in clear, indisputable detail. But when he got there all he saw was the surface of the calm water, almost tranquil in its stillness, not a ripple to be seen or a noise to be heard. He waited. Nothing. Disappointed, Tim realised Nessie had plummeted back to the murky depths from whence she came. He was left with just a taste of her unusual make up to contemplate. As a trained engineer, Tim knew the object would need some sort of datum, a point of reference so both the animal’s size and speed could be measured. He made an arrangement with the hotel proprietor to retrace the animal’s path using a 14-foot wooden fishing boat. Tim returned to the exact spot where he’d filmed the animal an hour earlier and using the remaining few feet of film panned his camera once more toward the loch. His intent was to capture the contrast — he already had the monster! A person can clearly be identified sitting in the back of the boat as it travels parallel with the north shore.